2. The Resolution comes into force on 01.11.2004.
resolution № 48/41 on 21.10.2004. 1. The following Rules are obligatory for all drivers going to the frontier point through Narva City territory. 2. All drivers who follow to the frontier point are obliged to enter the transit area which is located at Rahu 4a, Narva City, where the entrance sequence is set. 3. The control officer forms separate lines for passenger carrying vehicles, large goods vehicles and passenger cars and controls the sequence order. 4. To confirm the sequence the control officer produces a sequence ticket for drivers. 5. The sequence is set according to the natural queue and according to the sequence ticket number. 6. In order to avoid congestion on Narva City streets and provide safety the cars are to leave the transit area if only there are no vehicles on Malmi st., Tuleviku st., and Peetri Square awaiting to enter the frontier point. 7. The information about presence of vehicles on Malmi st., Tuleviku st., and Peetri Square awaiting to enter the frontier point is provided by the transit area control officer. 8. Large goods vehicles following the frontier point, must go through Narva City territory according to the following route: Tallinna mnt. – Rahu Street – transit area on Rahu 4a – Kerese Street – junction of Pushkini st., Kerese st. and Tallinna mnt. – Tuleviku st.
9. Large goods vehicles coming from Russia must go through Narva City territory according to the following route: Tuleviku st., - junction of Pushkini st., Kerese st. and Tallinna mnt. – Kerese st., - Rahu st. – Tallinna mnt. 10. 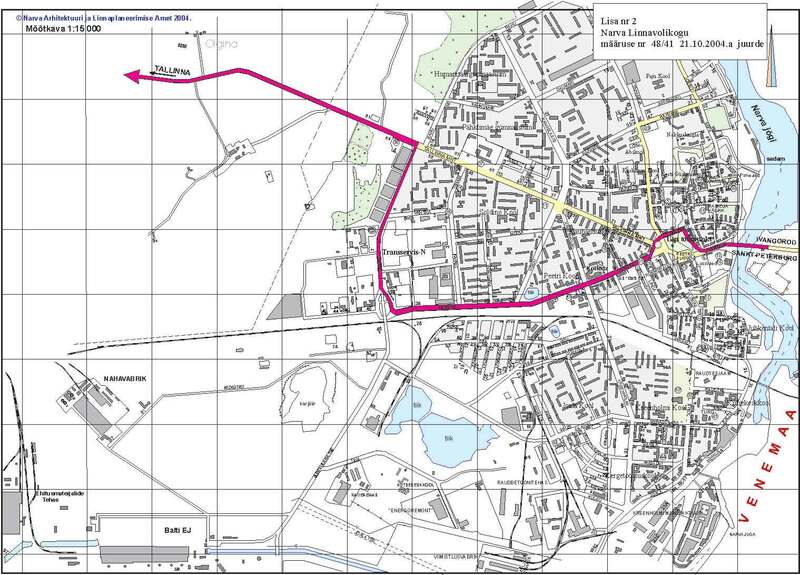 Large goods vehicle traffic through Narva City territory from transit area to the frontier point is shown in Appendix 1 of the following Rules. 11. 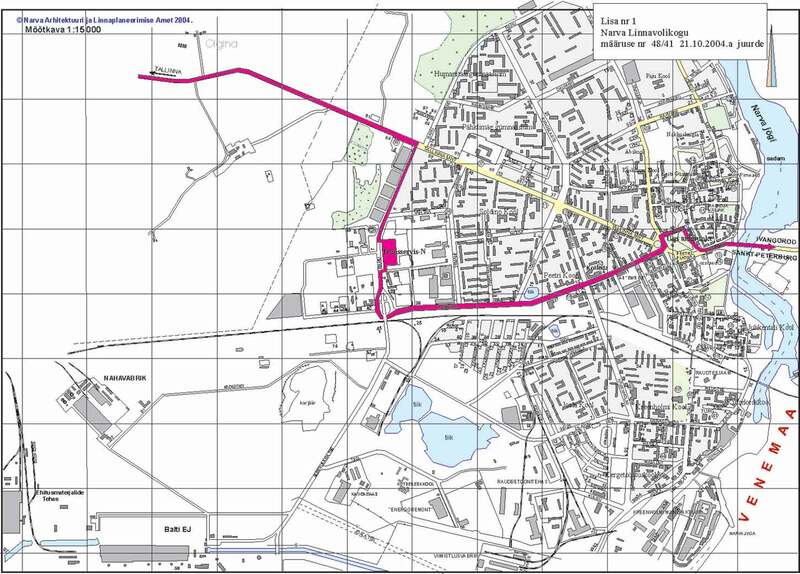 Large goods vehicle traffic through Narva City territory from the frontier point to the border of Narva City is shown in Appendix 2 of the following Rules. 12. Passenger cars and passenger carrying vehicles must follow the road signs on the way to the frontier point. 13. The following Rules do not cover diplomatic vehicles and vehicles of the state and local government bodies of Estonian Republic.